Today's contributors are ESPN Fantasy's Jim McCormick, André Snellings and Kyle Soppe. 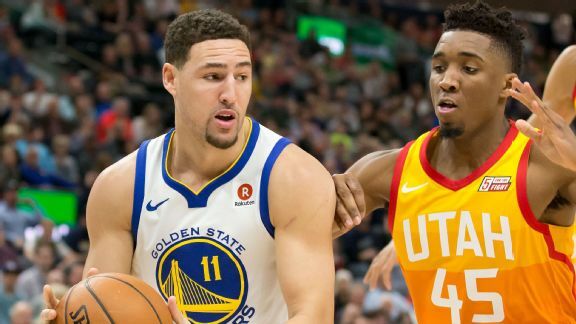 Looking to the future, who would you rather have in a keeper league: Klay Thompson or Donovan Mitchell? André Snellings: This is a close one. Thompson has had a slightly better fantasy season than Mitchell this season, ranking about a point higher on the Player Rater and averaging about 1.5 more fantasy points in ESPN standard scoring points-based leagues. Thompson's production this season is almost an exact replica of his numbers last season, and with his three superstar teammates expected to return next season, there's no reason to expect his numbers to change moving forward. Mitchell, on the other hand, has a huge variance in potential expected values moving forward. He's a rookie, which means he's got huge upside to improve, but he also could go the other way into a sophomore slump. All of that said, dynasty leagues usually give the option of keeping a player for multiple years, beyond just next season. Mitchell projects to being the bigger producer in the future because the team is planning to build around him as an offensive focal point, and he should eventually improve (sophomore slump or no). Put it all together, and I'll choose Mitchell based on upside. Jim McCormick: Thompson is arguably one of the greatest shooters in the history of the game. This season, he leads the NBA with 11 PPG on catch-and-shoot opportunities and paces the league in 3-point percentage. This all said, I'm going with Mitchell. A six-year age margin is sizable, but it's more than mere youth on Mitchell's side; he's eerily mimicking Damian Lillard's brilliant rookie season, save for a lower assist rate. I believe Mitchell will continue to grow as an isolation scorer and high-usage centerpiece for the Jazz. Another advantage is a steal rate that doubles Thompson's this season. I have no doubt Thompson could become a top-15 fantasy contributor if he were afforded the keys to an NBA offense, but it's pure speculation this ever happens, given the context of the Warriors' historic lineup. Kyle Soppe: For me, this is Mitchell, and it may not be close. Sure, we have the stability of Thompson (this is his fifth straight season posting a similar stat line), but considering that Mitchell is giving us similar production and is 6.5 years Thompson's junior, give me the upside every time. While Thompson is pigeon-holed into his role, Mitchell (the 13th overall pick in the 2017 draft) projects as a potential building block for the Jazz, something that has me believing that his usage rate stands to rise, and that is saying something, considering that he already ranks sixth at the SG position. Mitchell's athleticism has me believing in his 56.1 percent shooting from in close and his jumper is ahead of where I thought it would be (shooting 37.5 percent from beyond 16 feet), so I don't think it's crazy to think he can continue to score with Thompson while averaging upwards of five rebounds and five assists sooner rather than later. Both are pieces I'd love to roster in a dynasty format, but if you can trade Thompson for Mitchell based on name recognition right now, I'd go for it. Thompson has a higher floor in the sense he can carry your 3-point shooting in the seasons ahead, but Mitchell is the one, like Lillard, who can ascend to fantasy superstardom.